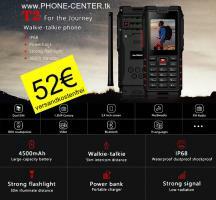 ﻿ioutdoor T2 Smartphone/Walkie Talkie/ Waterproof IP68 rating, fullfill all your needs as a outdoor enthusiast. Ultra-tough body with exquisite workmanship, lightweight, silk smooth and soft touch, premium feel, which delivers a professional service under whatever kinds of extreme hard envirment and tough occasions. Take with it to go over mountains and cross streams, 4500mAh power super long time standby, as A fan of outdoor living, what are you waiting for? ﻿Ergonomic design, not only reinforce the structure of the phone, but also brings the comfortable texture to your hands. Walkie Talkie UHF400-470MHz, 5km range(in the open fields), Incredibly strong signal, to ensure the high quality of communications anywhere and anytime. 2G GSM Two SIM cards for dual network, allowing for maintaining the balance between business and privacy perfectly. High-definition display, 2.4inch QVGA TFT display offer you the best experience of all the feature phones; Equipped with a 1.3MP waterproof camera with flash LED. 4500mAh battery, provides a super long stanby-by time and usage time; Built-in FM radio module along with loud Speaker.